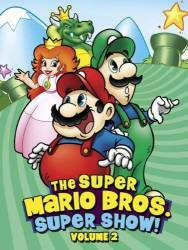 Other mistake: On the "Mario's Greatest Movie Moments" DVD of this series, from the main menu, go into the trivia game. The fifth question asks you about the Super Mario Bros. Super Show episode 'Count Koopula.' It asks you "What's room number that the Mario Bros. were put into in Koopula's Castle?" It's supposed to say "What's THE room number that the Mario Bros. were put into in Koopula's Castle?" More mistakes in The Super Mario Bros. Super Show! Trivia: When the Quirks uses their noses to play a song to get rid of Koopa for good, they play the theme song from the video game The Legend of Zelda. Trivia: While some of the special guests that appeared in the live-action segment are actual celebrities (e.g. Magic Johnson), the rest were impersonators (e.g. an actress was used to impersonate Cher). Mario Mario: We need your Hocus Pocus. Can you make us fly? Genie: Fly? Do you know what a drain that is on me? Luigi: No problem. Any drain you got, we can fix. We're plumbers. Mario Mario: Tell you what, you make us fly and I'll grease your palm with a gold coin. Genie: Now you're talking. Eeenie meenie miney mo. Make'em fly. I need the dough. Mario Mario: That's a heaping helpin' of moolah. Luigi: Yeah and that's a lot of money too. More quotes from The Super Mario Bros. Super Show!